It is important not to overstate the effect of things like the DNC email scandal. The pundit and political fandom classes are wholly unrepresentative of the nation. Probably 95% of the public could not tell you who Debbie Wasserman Schultz is. The majority probably could not even tell you what the DNC is. For these and other reasons, the scandal just cannot have that much of an effect. Nonetheless, the scandal is still worth remarking upon because of what it reveals about a certain kind of pro-Democrat argument. According to this argument, the Democratic party should be understood as a coalition between leftists and liberals, broadly speaking. Whereas in normal countries, you have separate left parties and centrist parties that then create external coalitions to form governments, the Democratic party is supposed to be a single party that contains the leftist and centrist blocs internally. In a multi-party system, the left-of-center blocs compete for leadership of their coalition by seeing who can grow the largest party. The head of the largest party in the left-of-center coalition then becomes prime minister or leader of the opposition. For the single-party coalition to work similarly, the internal blocs must be able to compete internally to see who has the largest internal support. And crucially, that internal competition must be fair. If the internal Democratic competition is rigged in favor of the liberals, then the leftists have no real reason to participate in the coalition. And vice versa. Participation in the coalition is supposed to be based on the promise that the bloc you belong to has the ability to lead the government. But if the thumb is on the scale against your bloc, that promise is betrayed. Where the neutral arbiter of the internal competition is in the tank for the other bloc, you don't really have the ability to lead the government. All you end up doing is supporting the permanent leadership of the other bloc. No doubt liberal partisans like the idea of a permanently impotent leftist bloc that they can nevertheless dupe into swelling the ranks of the Democratic party. But it is hard to see what leftist partisans get out of such an arrangement. Donald Trump's acceptance speech at the Republican National Convention has provoked the usual - and correct - chorus of concerns over his racist politics. Dara Lind, for example, warns of "the danger Trump's policies" would pose to "nonwhite bodies and lives", and argues that his rhetoric was an exercise in "weaponized white fear". Nearly Four in 10 African-American children are living in poverty, while 58% of African American youth are not employed. 2 million more Latinos are in poverty today than when the President took his oath of office less than eight years ago. Another 14 million people have left the workforce entirely. That last quote is particularly telling because Trump even made sure to avoid erasing queer / questioning folks - the Q in "LGBTQ" wasn't there in the draft remarks. Even Clinton, with all of her celebrated progressive sensibilities, routinely leaves them out. The line is also telling because it gestures directly at his specific agenda: even as he affirms the rights and dignity of the LGBTQ community, he warns about the "ideology" that threatens them and makes a point of describing it as "foreign". What he has in mind, of course, is Islam, and when he says he'll "protect" people from it what he means is that he'll launch a sweeping reactionary attack on Muslims around the world. There are a full range of radical policies on the table here, ranging from discriminatory immigration controls to selective rollbacks on civil liberties to draconian police actions at home and abroad, all targeting Muslims. But you would only know this is you knew all kinds of policy details that (here, at least) Trump doesn't spell out. Similarly, his concerns about the unemployment and poverty of Americans of color are clearly being voiced in the service of a reactionary capitalist assault on taxes, regulations, and international economic equality - and yet again, you would only know this if you looked elsewhere in his speech and read between the lines. What Trump's speech proved last night is that fascists can speak the language of liberal identitarianism just as well as liberals. In and of themselves, the concerns that Trump frequently touched on were often absolutely indistinguishable from those routinely voiced by Hillary Clinton and her media surrogates. The rhetoric of identity, diversity, and emancipation was all there, with all of the requisite shout-outs to key constituencies - but all of this Trump co-opts on behalf of a fascist agenda centered upon a radical and violent tribal consolidation of power. At first glance, it would seem like liberal identitarian politics are incompatible with fascism, and in a limited sense this is true. The fascism of the early twentieth century mobilized, en masse, psychopathological tribalism around ethnonationalistic identity, and accordingly, liberal-left identitarianism has countered that threat through a commitment to racial and international pluralism. Trump's occasionally explicit ethnonationalism is a relic of that earlier fascism, and he is likely to fail precisely because the taboo liberal-left identitarianism has built against it is so powerful. Again: liberal-left identitarianism has significantly (though not completely) succeeded in rendering verboten the kind of blatant anti-Semitism that characterized Nazism. But what matters here are the "psychological mechanisms" that anti-Semitism relies upon, and that make it such a powerful and destructive force. If they are at work, then you can have fascism without anti-Semitism - a fascism organized against some other form of identity. And in fact, the expansive cathexis of Nazism against multiple forms of identity - racial, ethnic, religious, national, sexual, the disabled, and so on - suggests that the psychology of fascism has less to do with the particulars of any given identity, and more to do with their general otherness from whatever tribe is in power. If an identity group can be socially constructed as alien and placed in an antagonistic relationship with everyone else, primitive tribal psychology can facilitate a dangerous catharsis of socioeconomic anxiety. to bracket off interrelated struggles from each other and to segregate the oppressed into independent vanguards...doom[ing] the left to endless atomization and internecine conflict. Because liberal identitarianism concerns itself with every identitarian conflict but one - class struggle - it guarantees a society that will always remain at war with itself. (Or as capitalists like to put it, "in competition".) Even as liberal identitarianism battles oppression, capitalism will perpetually foment new antagonisms - and in this way, the two will maintain a toxic equilibrium that serves as a breeding ground for new forms of fascism. Circling back to Trump, we should not be surprised to find fascism tailoring its message to evade the scrutiny of liberal identitarianism's fight against oppression. Like all fascist rhetoric, Trump's is slippery, opportunistic, and utterly superficial; it can easily adopt different languages for the sake of political expedience, just as the Nazis occasionally gestured towards socialism. But socialism, in its fight against all forms of oppression, bears with it the hope that one day the sophistry of fascism will eventually disappear. Liberal capitalism, on the other hand, only guarantees that fascism will keep coming back. And Trump's occasional flirtation with identitarian rhetoric gives us a glimpse of fascism's future. For capitalism to survive, it will have to speak the language of plurality and emancipation - even as it quietly tightens the noose. There are many reasons why the media delights in bashing the GOP. The media is mostly composed of moderate liberal types and so the GOP is their political enemy; the media is largely cloistered in coastal cities where they have little daily interaction with GOP partisans; and the media, like most other moderate liberals, get off on a kind of smugness that requires a depraved political foil. For a long time, I figured this was enough to explain the media's comfort in slamming such a huge portion of the American public. But lately I feel like the above theories are not enough. They simply can't explain the vicious level of almost carnal hatred the media has for the GOP and its supporters. Something more must be going on. After puzzling over what that something could be, it hit me: the media feels comfortable bashing the GOP because it is a party mostly made up of women and people of color. In 2012, 55 percent of Romney voters were women and people of color. And there is nothing elite coastal types like more than shitting over women and people of color - when they think they can get away with it. The existence of other objections to the GOP provide them the cover they need to finally act out their implicit and explicit biases against organizations predominately made up of women and POC. Ian Williams has laid out a point you've probably heard before: a recession in the next four years seems likely, and the party whose president presides over it is screwed. Of course, neither of these predictions are at all certain - but both of them strike me as absolutely plausible. A survey of 31 economists suggests that the next downturn will hit in 3 years, according to Bloomberg, which cautions that "Barack Obama's successor" will have to "bring a plan to fight the next recession." Meanwhile, it's long been a political truism that "positive real growth matters when voters cast their votes for president" (343, Kahane). If we take these considerations seriously, some extraordinary possibilities are on the table. A Clinton win this year will would mark the first time since Truman that Democrats have won three consecutive presidential elections. There's every reason to assume that voters would punish Democrats in 2020 for any recession that we get in the next four years, just as they punished Bush for the 2008 recession, and that whoever Republicans nominate next time around will be our next president. Conversely, if Trump were to preside over another recession, it seems somewhat unlikely that Republicans would be able to escape blame in 2020 for dropping the ball once again. I don't think that any of these are at all safe predictions, but they're certainly as plausible as anything anyone else is saying. Which brings me to what I actually want to ask: why don't our liberal "pragmatists" ever even consider the advantages of taking a strategic loss? As our Democratic intelligentsia never tires of reminding us, progress is a long game. Realism and pragmatism mean accepting short-term losses and compromises for the greater good. Political wisdom and maturity is about recognizing that we can't get everything we want every time; savvy pundits and politicians know what fights to avoid and which causes are lost. From all of this, it would seem to follow quite directly that it might, on occasion, make sense to lose an election. Perhaps, as in 2016, historical and economic conditions suggest that whichever party wins this election is likely to lose the next two or three. Perhaps a constituency is, in the long-term, better off disciplining their party by withholding their votes for one election cycle than they would be if they just let the party take their support for granted. Perhaps the balance of power is such that any cent donated or hour volunteered for a presidential campaign would be better spent on down-ticket races. (This is certainly the sort of calculation party officials make when allocating party resources.) There are a near infinite numbers of possible reasons why, on occasion, it might make sense for Democrats to take a strategic loss. And yet not only do we never hear "pragmatists" actually argue this - as a rule, their rhetoric decisively rules out the very possibility. For instance, it's perfectly obvious that the go-to "we must protect the Supreme Court" can and will be invoked in every presidential campaign until the end of time as a "pragmatic" position - even though it might actually make sense to lose a seat or two in the short term for the sake of protecting more seats in the long term. Only the most immediate stakes and outcomes ever deserve our attention, and in every election, for every seat, every position and every principle is up for compromise except one: the Democrat must win. Of course, it's entirely possible that we won't have a recession in the next 4-8 years. Even if we did, it's possible that the voters wouldn't hold whoever wins this election responsible. Perhaps if we somehow did some kind of long-term analysis of likely electoral outcomes and consequences over the next several decades, we would find that voting lesser-evil every time is preferable to periodically disciplining one's party and accepting a short-term loss. These are all defensible arguments; suffice to say that they aren't the kind of arguments our pragmatists ever actually make. Taking the long-view is what pragmatists do, but few who call themselves pragmatists actually are. Terrell Starr has published a new article aspiring to explain How Bernie Sanders lost black voters. As he explains elsewhere, what's "new" about this piece "is that [Sanders'] own former black staff is critiquing his campaign." Specifically, the article is built around quotes from two staffers who are willing to go on record: deputy director for African-American outreach Roy Tatum and National HBCU Outreach Director Danny Glover. Read through Starr's article, however, and you'll notice how little of its critique actually comes from Team Sanders. Tatum insists that Sanders was "sincere to the core" in his outreach to black voters, and that campaign leaders simply "didn't have confidence" he could win them from Clinton - but this was always conventional wisdom during the primaries, and reads like pessimism rather than criticism. The rest is just Tatum and Glover explaining how that assessment predictably dictated spending priorities. Tatum says "his department was underfunded" and that they had to go through "hoops to get resources"; Glover, meanwhile, says there "wasn't enough money" to continue their HBCU tour after February, and adds that "they didn't put as many people behind it as they should have." That's it. That last "should have" is as close as Starr ever gets in this article to what's ostensibly new about it: black staffers going on-record to criticize the campaign. And among black campaign staffers he can't even find consensus on that modest critique; later in the article, national press secretary Symone Sanders insists that "as a person who was there on the ground, I can tell you that the campaign had a staunch commitment to reaching out to communities of color." failed to win the hearts of black progressives. It didn't have to be that way. But his campaign never explained how black people fit into his vision of a radically changed America. Note that none of this actually follows from the on-record information Starr gets from the campaign. Neither Tatum nor Glover make "it didn't have to be that way" claims, and neither draw the conclusions about Sanders' actual message that Starr does. All of that comes from the author's own editorializing, or from third parties with no connection the campaign, or from ambiguous paraphrases, or from staffers who speak "only on condition of anonymity". Every time Starr needs to make a claim that advances this argument, he relies on one of those four sources - never on on-record quotes from black campaign staffers. Starr does not, for example, get a Sander staffer to say that the campaign's problems came from "white privilege, or simple cultural ignorance of black people" - that's all Starr. He doesn't get a staffer to complain that Sanders has a "colorblind approach to economics" - that's Clinton media surrogate Tara Dowdell. He doesn't quote Glover saying that "the campaign had no real interest in converting young black progressives into a powerful voting bloc"* - that's just a paraphrase. He doesn't quote a staffer saying that "the Sanders campaign had no real interest in engaging black voters" - that's just a paraphrase of an anonymous staffer. Time and time again, when Starr has the opportunity to substantiate the article's critique with an on-record quote from a black Sander staffer - EG, what he seems to be promising - we get something else. Or he does get a quote, from a black Sanders staffer like Symone Sanders, but it directly contradicts his argument. Or he tries to talk to other Sanders staffers, like African-American outreach director Marcus Ferrell and campaign manager Jeff Weaver - and they refuse to play ball. [An anonymous Sanders] staffer said that the campaign even tried to block me from covering a visit by Sanders to Atlanta for Fusion because I had reported critically on the senator in the past. Sanders can gain the trust of more black voters...though many question his personal resolve to do so...The concern is that there is a belief that his campaign is operating on the assumption that its candidate doesn’t have to do the work of connecting emotionally with black voters and earning their trust. If this analysis sounds familiar, it's because it's the exact same one that Starr tries to advance in this latest piece. And yet despite ten months of reporting, he's never once been able to substantiate it. Instead, all we get are claims about how "many question" this or how "there is a belief that", or all of the dubious sourcing mentioned above. I've challenged him before on these basic reporting problems (as did Matt Bruenig in his classic Nobody Is On Twitter piece), but he's never been able to address them. So while others may be more inclined to give Starr the benefit of a doubt when he comes up with all of these convenient paraphrases and anonymous sources, I am not. Certainly the Sanders campaign made a strategic decision early on to focus on young voters, including young voters of color*, which necessarily came at the expense of everyone else. This was obvious long before Starr got staffers to say this on record. Does it follow that the Sanders campaign had "no real interest in engaging black voters"? Nope. Starr has tried to argue this for nearly a year, but no black Sanders staffer is actually going on-record to say this, for obvious reasons. 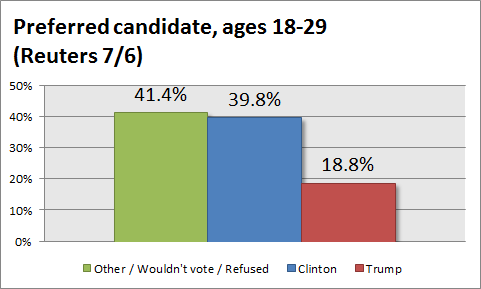 * The theory that the Sanders campaign "had no real interest in converting young black progressives into a powerful voting bloc" is particularly odd since Sanders won 54.6% of young black voters, versus Clinton's 33.5%. Anyone familiar with the history of red-baiting in the United States will instantly recognize all of the major themes here. Leftists are outsiders, largely based in the universities, who do not belong in the political debate - but who have infiltrated it to advance their alien agenda. They are secretly racists who are advancing white supremacist ideology in order to promote their ideas about socialism - and even when they are black themselves, or are working in solidarity with the black community, they are just being opportunistic. Opportunistic radical groups from across the country are flocking to Ferguson, Missouri to take advantage of the death of Michael Brown, a young black male shot by local police...They’re members of the Revolutionary Communist Party USA...[They say] It wasn’t George Zimmerman that killed Trayvon, just like it wasn’t the Ferguson police that killed Mike Brown. It was capitalism...Is it any wonder the riots continue despite a change in who is handling things on the ground in Ferguson? All the elements are here. Communism is coming out of the universities ("hyper-educated dudes at elite institutions"), "they" are all "white", and they are opportunistically advancing their ideology at the expense of other races ("never seems to include brown and black people"). Only when pressed at length to specify these sinister elements did Bouie admit he was wrong about them - but the initial smears were of course far more popular than the retraction. Functionally, the end game of this rhetoric is always the same: to break solidarity and thwart coalition building among the left by portraying anticapitalism as some kind of outside divisive force. And necessarily, it does this with vague, flimsy references to mysterious operatives which collapse given even a moment's scrutiny. In the 50s we called them communist infiltrators; in Ferguson, outside agitators; today, we call them brocialists. There's no need for us to be creative or to take initiative ourselves - we should base our activism on the assumption that the oppressed will lead the struggle. This is a close paraphrase of an actual argument I've seen online (quoted indirectly because the writer isn't a public figure) - and again, it rehearses a fairly common position. And one that, however well intentioned, is philosophically bankrupt and strategically disastrous. Historically, this version of the "oppressed must lead" rhetoric has its basis in both the doctrine of identitarian deference (ID) and in left critiques of Blanqui-style vanguardism - but it crucially misunderstands them both. A major premise of ID is that the oppressed understand their oppression better than anyone, and that privileged people should therefore defer to their insights about it. There are all kinds of serious objections to this theory, but here it's enough to point out that ID does not actually imply that the oppressed are better positioned and resourced to organize anyone, or that they have some kind of superior insight and expertise into questions of strategy and tactics. These are bizarre extrapolations from ID that its philosophical basis does not even aspire to support; it's cargo cult identitarianism, wholly disconnected from the intellectual tradition it's borrowing its rhetoric from. What ID specifically argues is that people who are oppressed better understand the experience of oppression. A woman, for example, understands misogyny in a way that a man never can precisely because she has been subjected to it and experienced its consequences, whereas he has not. For this reason, we should defer to a woman when she is telling us what her oppression is like, rather than second-guessing her or substituting our own perspective. The man who (for example) says that catcalling on the street is "no big deal" is not actually in an epistemelogical position to make this claim, because he has not experienced a life of catcalling and has no way of really knowing what it is like. All of this will read like fairly common-sense to the modern liberal-leftist; its argument overlaps directly with Hegelian and existentialist premises about subjectivity that most readers will take for granted. Suffice to say that nothing here even remotely suggests that the oppressed, from their oppression, will derive some kind of superior plan for emancipation. There is no particular reason why, for example, a woman would necessarily have some superior judgment about whether or not catcalling is a problem best dealt with through social shaming or legislated fines. Nothing about this sort of oppression gives one insight into problems like the administrative logistics and efficacy of speech fines, or the large-scale, long-term viability of shaming as an effective tool of ideological discipline. A woman might know more about this by virtue of being smarter than a man, or better educated, but nothing about being catcalled last week somehow imparts this kind of knowledge. Another point of origin for the "oppressed must lead" rhetoric comes from the historical anarchist critique of vanguardism, which concerns itself with the power dynamics that can emerge when a small group of people attempt to lead an aspirationally democratic movement. This line of criticism has been around forever, but it became most historically prominent when mobilized against Lenin's efforts to build a party that spoke for the proletariat. As Martin Buber warned, this sort of cadre is always in danger of abusing its organizational power to exercise political power: "One cannot in the nature of things expect a little tree that has been turned into a club to put forth leaves." The standard Marxist response to the critique, articulated by writers like Gramsci (among others), was to insist that the proletariat can only "become the leading and the dominant class to the extent that it succeeds in creating a system of class alliances which allows it to mobilize the majority of the working population against capitalism and the bourgeois State" (Pre-Prison Writings 320). Put simply, left organization must proceed on the basis that we can only win if we cooperate. That is what keeps any particular vanguard or organizer from assuming power: the understanding that they can only win with the support of other oppressed groups. Leftists who are focused on the anticapitalist aspect of activism have to appreciate that they can only succeed if they share power with those who are focused on antiracism, and feminism, and so on. The solution here is not to try to engineer elaborate rules of who gets to have the power when we are organizing - it's to take power out of organizing altogether by emphasizing shared struggle and solidarity. This vision of organizing is certainly compatible with the "oppressed must lead" rhetoric in the broadest sense that it is a coalition of oppressed groups that have to lead the fight against oppression. However, it is quite at odds with this narrower attempt to bracket off interrelated struggles from each other and to segregate the oppressed into independent vanguards. That approach is not only baseless from a historical and philosophical perspective, but will certainly doom the left to endless atomization and internecine conflict. The murder of two more black men in the United States has prompted the left to once again relitigate its position on gun control. I won't attempt to tackle that broader controversy here, but one narrow claim I do want to take on is the theory that restrictive gun control laws are counterrevolutionary insofar as they prevent the proletariat from arming and defending themselves - against capitalism in general, and killer cops in particular. Here, my objection is simply tactical: I just don't think that conventional gun rights can give us the ability to defend ourselves from the modern hypermilitarized government of the United States. 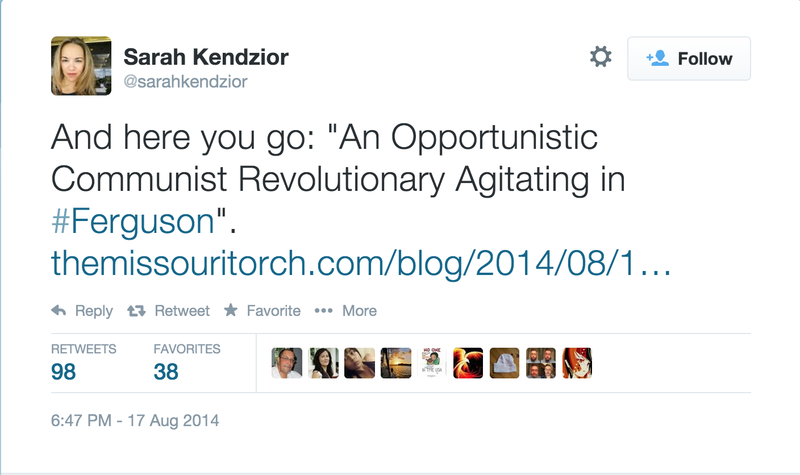 Not at the level of revolution, and not even at the level of effectively resisting racist police violence. While black folks may successfully defend themselves from the cops on occasion, these will be exceptions to the rule. If such incidents evolve into a meaningful resistance movement, the state will crack down on it, and the state will win. relies entirely on transforming every inch of contested territory into a battleground. On using civilian infrastructure and civilians themselves as shields and shelters from superior forces. And on defeating firepower with willpower by protracting the battle as long as possible. It cannot be fought without scorched earth and salted fields. It can’t end without leaving a scarred civilization and a neurotic society in its wake. And more likely than anything, it doesn’t end at all – it simply persists in a horrific stalemate for decades. It seems perfectly obvious to me that this is how any serious militant self-defense campaign would actually play out. We saw this exact pattern of escalation in Ferguson: as soon as the protests began to pose even a minor threat to police control of the city, the tanks started rolling in - literally - and the opposition was effectively squashed. There was no political will on the ground to fight back against this, and even if there were there is zero chance that the protesters would have succeeded. More to the point, however: even if you do think that the left in general (and black folks in particular) can build some kind of meaningful resistance against capitalism and racist policing, it seems hilariously unlikely to me that such an effort would actually remain legal. As soon as the state and the police feel threatened, the very first thing that will happen is the government will impose emergency restrictions on our right to self-defense. The terrorist watchlists will expand, the FBI raids will ramp up, legislators will suddenly be fine with passing gun control laws that long seemed politically impossible, etcetera etcetera. The idea that the white supremacist bourgeoisie is going to sit on its hands because we've lawyered them into a corner with our expansive second amendment rights is absolutely absurd. Some arguments on the left against aggressive gun control laws hold up a lot better - for example, one can insist that people should have a right to self-defense against extrajudicial murder, whether or not that right actually translates into the possibility of a broader and effective resistance movement. Here, I just want to reject the revolutionary argument for trying to use the law to guarantee gun rights, which strikes me as pretty silly for reasons given. This is a potential catastrophe for Clinton. It's one that she's been aware of since 2008 and that she's spent the past several years preparing for. She's tried pandering to youth culture, criticizing young women for being unsatisfactory feminists, pretending that she doesn't need the youth vote, guilt-tripping them, and simply pretending that she already has their votes. And now that none of this has worked, we're seeing what Hillary Clinton does as her absolute last resort: she actually advocates the policies that voters are demanding from her. Denying government benefits to rich people just makes it that much harder for less than rich people to qualify. You know, eligibility, forms, a bureaucracy to determine that eligibility, etc. The way to not give Donald Trump's kids free college involves increasing his taxes. Then give the kids "free college." Democrats really need to get rid of their obsession with means testing everything. That's why Bernie Sanders insisted on making free tuition universal, and that's why young voters should, too. But they shouldn't stop there. However meager it is, Clinton's tuition proposal is proof that young voters have leverage over her - and they should use it to demand as much as they possibly can. Clinton and her surrogates are going to spend the rest of this campaign making variations on the same arguments that they've made all along: that she doesn't need the youth vote, that young people owe her their vote, that young people are already voting for her and you should, too. Don't buy it. Demand more. Working class folks don't have much of a voice in our national political debate - except, that is, for those involved with professional wrestling. Despite their massive celebrity and platforms, professional wrestlers are often middle class at best - and even those who are wealthy are only recently wealthy. All of them, in any case, spent their entire lives immersed in working class culture, and so when they start talking about politics, you can hear the distinct echoes of a million struggling men and women all over America. I don't know how I've missed this before, but listening to the working class talk about the lesser-evil problem, you notice an unmistakable difference in tone from what we hear from liberal elites. Like most Americans, Goldberg isn't particularly happy about having to choose between Trump or Clinton. He feels trapped. He accepts the lesser-evil logic, as most Americans will, but he realizes the grim implications, and he accepts it with clear resignation and despair. People who refuse to vote for a less-favored Democrat on principle...Do something besides pretending that your lack of vote does anything but suit your own moral superiority at the expense of others. Neither of these people disagree with the Goldberg in principle - all three, for better or for worse, accept that one has a moral responsibility to vote for the lesser-evil. But while the latter clearly sees this as a horrific tragedy, Chait and Arceneaux voice no such misgivings. They are if anything pleased that the two-party system has once again engineered an outcome where decent people feel forced to vote for the neoliberal. Chait celebrates this logic as a "fact" in all of its merciless inevitability; Arceneaux searches sadistically for all of the monstrous implications he can tease out about people who try to escape from the two-party trap. Once you notice this, you can't miss it. As lesser-evil voting pushes our country further and further to the right, liberal elites are forced to at least acknowledge its inexorable logic - but instead of decrying it, they reserve all of their animus for those who are being destroyed by it. This is a tone you never hear from the working class, for obvious reasons.